The Yamaha is being sold by the original owner that bought the boat new in 2011. Per the seller: The engine and the boat runs great -- and it is FAST!! The boat is always stored under full cover when not in use. Stock #039508 Freshwater only!!! Only 70 hours!!! If you are in the market for a bowrider, look no further than this 2011 Yamaha 210 SX, just reduced to $32,000 (offers encouraged). 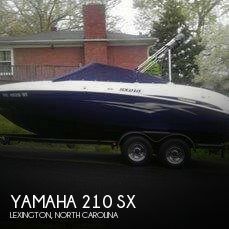 This boat is located in Lexington, North Carolina and is in good condition. She is also equipped with twin Yamaha engines that have only 70 hours. 2017 Yamaha Boats EX Deluxe 2017 Yamaha EX Deluxe "CLICK FOR QUOTE" AND CHECK OUT OUR NO HAGGLE PRICING! No extra Freight Charges! Due to our Sales Volume and Multiple locations, please call to verify particular units in stock. Prices and Availability subject to change at any time. 2018 Yamaha Marine High Thrust 60 hp 2018 Yamaha Marine High Thrust 60 hp Yamahas High Thrust four strokes, are built for jobs that call for more musclelike pushing a heavy pontoon, adding extra kick to a multi-species boat or maneuvering a sailboat through a crowded marina. Available in 60, 50, 25 and 9.9 horsepower, their larger lower units and higher gear ratios produce substantially more thrust than conventional outboards of the same horsepower using standard propellers. In fact, when paired with our Dual Thrust propellers, (optional on T60/T50 and standard on our T25 and T9.9) Yamaha High Thrusts produce up to 60 percent more forward thrust and up to 70 percent more thrust in reverse. Our 996-cc 60-hp High Thrust four stroke is a powerful addition to a day spent pontooning. Its SOHC four-cylinder design, composite long-track intake system and proprietary YDC-30 aluminum alloy result in a 60-horsepower four stroke thats light, compact and generates tremendous thrust. Features may include: Compatible with mechanical controls, analog gauges and our Multi-Function Tiller Handle 262 pounds Available in 20 shaft length Solid 16-amp alternator Power Trim & Tilt MORE THRUST The Higher Gear Ratio on Yamahas High Thrust outboards make these powerhouses ideal for heavy pontoons and other applications that require an extra measure of muscle. MAX MUSCLE Increase thrust up to 60 percent in forward and 70 percent in reverse with a large-diameter, low-pitch Dual Thrust propeller. They're optional on our High Thrust T50 and T60, and standard on our T25 and T9.9, and are perfect for sailboats and pontoons. They can also be used on Yamaha Midrange outboards with 4.25" K gearcases. OPTIMUM PERFORMANCE Microcomputer Ignition adjusts timing to maintain optimum engine performance, economy and power under all conditions. SINGLE OVERHEAD CAMSHAFT A Single Overhead Camshaft (SOHC) design creates a compact, lightweight, space-saving design. FUEL ECONOMY Precision Multi-Point Electronic Fuel Injection on the T60 and T50 delivers the exact amount of fuel needed for optimum performance and efficiency. Yamahas EFI optimizes fuel atomization, further enhancing fuel economy. SPORTY NEW LOOK Because the Yamaha High Thrust T9.9 is such a popular kicker motor for the V MAX SHO®, its now available with an optional, V MAX SHO-inspired sport cowl. This creates a consistent look between your outboardsand throws a whole lot of attitude on the back of your boat. 2018 Yamaha Marine V Max In-Line 4 175 hp 2018 Yamaha Marine V Max In-Line 4 175 hp The In-Line Four V MAX SHO four strokes have achieved the unthinkablepacking signature V MAX SHO hole shot and acceleration into streamlined designs. These 1.8- and 2.8-liter dynamos feature surprising tech packages with 16 valves, double overhead cams and electronic fuel injectionfor maximum efficiency and high performance. This makes the I-4 V MAX SHOs perfect for smaller bass, flats and bay boats and other performance hulls. With the addition of 25-inch-shaft options for all of our I-4 V MAX SHO outboards, anglers prowling big waters on multi-species, bay and flats boats have a competitive edge that runs deeper than ever. Lean and mean, the I-4 V MAX SHO® 175 delivers exhilarating hole shot and class-leading top speed. It clocked in at 62 mph with a tournament loadfive mph faster than its VF150 sibling. * Features may include: 2.8L high-output four cylinder 480 lbs. dry weight 50 amps of charging power Command Link® compatibility with Variable Trolling QUIET POWER AND PERFORMANCE The I-4 V MAX SHO® design maximizes combustion efficiency in a way that no two stroke can, delivering clean, quiet power and performance. MIDRANGE POWER AND RESPONSE The V MAX SHO® 175 and 150 feature Variable Camshaft Timing, which optimizes the angle of the intake camshaft to increase power and throttle response in the low- and mid-RPM ranges. FUEL EFFICIENT In-line Four V MAX SHO® designs are up to 40% more fuel efficient than traditional carbureted two strokes. OPTIMUM POWER Precision Multi-Point Electronic Fuel Injection and long-track intake system combine to maximize power and fuel efficiency across the line of In-Line Four V MAX SHO® outboards. POWER MANAGEMENT An array of advanced sensors constantly provide vital atmospheric and engine conditions to the Engine Control Module (ECM), which instantly makes the precise adjustments for optimum performance. STREAMLINED POWER, EXTENDED All In-Line Four V MAX SHO® outboards are now available with 25-inch shafts. This brings V MAX SHO performance to multi-species boats, bay boats, pontoons and other 25-inch transom applications.